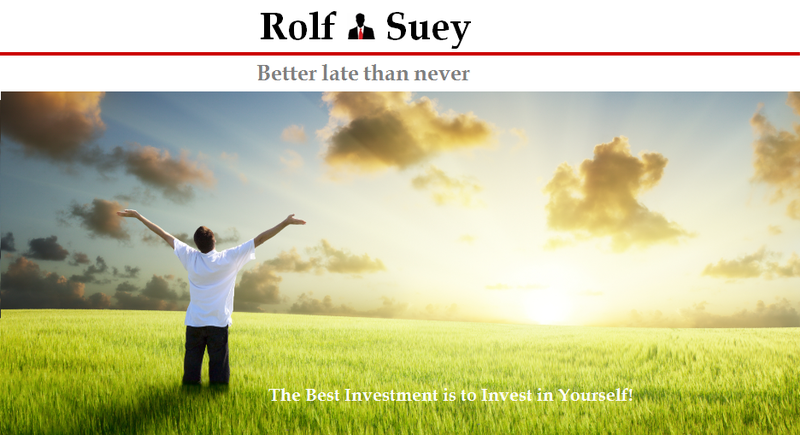 Rolf Suey - Better Late Than Never: Kim Heng - Growing or just another Beneficiary of the strong Offshore Outlook? A reader asked about why Kim Heng price is not moving much after the IPO. I decide to spend some time to look at the company. Honestly, I am familiar with Kim Heng years before its IPO, but I had not done any very detail financial research on the company. My following post is based from historical, industry and Rolf's sentiments. You probably need to go beyond that into the detail FA and decide for yourself. If you love family business, you are going to love Kim Heng! It is not difficult to find many “Tans” holding high positions within the company. Hopefully salary increment year after year will justify the performance of the management for the fairness of shareholders. The elder Tan (SK) and his younger brother Thomas Tan are inheritors of the 40 years old businesses from their father. Thomas Tan is the current CEO and major shareholder at 54%. The elder Tan had since retired from the business after public listing. Having said that, the elder Tan will still receive S$300k per year as honorarium payment of retirement benefits for the next three years. That is not too bad! One important question is also which of the Tans contribute more to the success of the business before IPO? In my opinion, family business normally has good survivability quality during bad times and can ride the uptrend during good times. One thing that may seems eluding compared to professional run companies, is the ability to grow. This is probably due to the increasing difficulty to attract talents into family run business, and the more conservative nature over the risk appetite for growth. The understanding of Kim Heng core businesses is critical in our decision to invest. Kim Heng businesses include ad-hoc shipbuilding and repair, rig services, fabrication of rig or offshore related structures, heavy lifting, vessel chartering, vessel sale, land transport, stockist of pipes, engineering design of offshore piping installations, warehousing, shipping, crew management, freight forwarding and many other services. It is quite a typical “we can do everything” company, without a specific niche. This is something I am not impressed! The service and repair business for International Rig or Offshore vessel owners such as Transocean, Seadrill, Saipem, Mcdermott etc is a lucrative one with high margins. The high margins normally arise from the urgent client requirements, which often place more emphasis on delivery time than pricing. This is definitely beneficial for Kim Heng business which also one of the reasons why majority of IPO proceeds will go into enhancing yard facilities for Rigs to come alongside. Being located in Singapore-offshore hub is beneficial for Kim Heng with many Rig and Offshore companies having base here. The favourable outlook of the offshore and marine industry is also one of the reasons why Credence Capital founded by Koh Boon Hwee – former Singtel, SIA & DBS and current Yeo Hiap Seng, Far East Orchard chairman is investing into the company and own 22.7% after IPO. Due to aging rigs, we also will see more rig servicing jobs required. However availability of skilled workers and rising cost of labour can be a concern. Aside from Keppel and Sembcorp, smaller players operating shipyards are often at risk of shortage of skilled labour and extremely high fixed yard overheads . This is also one of the reasons why I am not a fan of companies with shipyards. 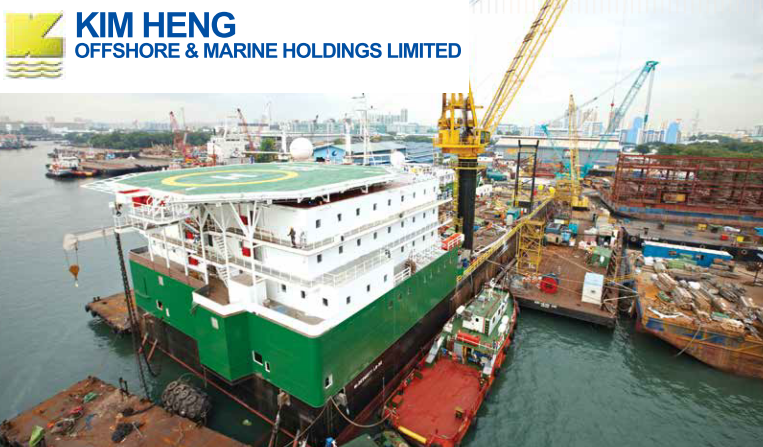 Competitors of Kim Heng include Global One, ASL Marine, Crystal Offshore etc who are also eyeing a “bite” in the very “sweet” rig service business. As mention, I had not gone into the very details but below you can find the financial for the past years. The S$9mil losses in 2010 are worrying and it is good to know the reasons behind it. On the contrary, I adores the impressive gross and net profit margins of >40 and 20% respectively. Cash and equivalent before IPO at S$3.5mil is relatively low considering the high overheads of shipyards, salary, and other project expenses! This may lead to many unhappy suppliers of Kim Heng not being paid on time, affecting the quality and progress of projects. 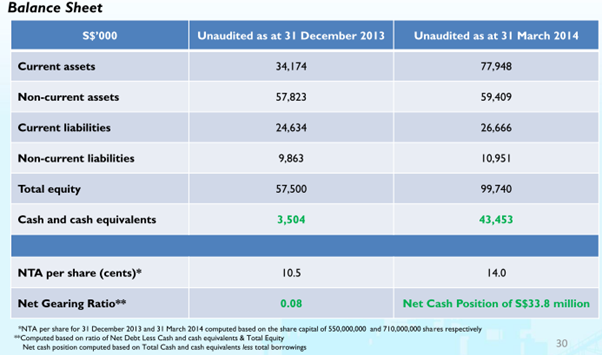 Improved cash position shown in 1Q14 result, is also primarily due to the S$36mil of IPO cash proceeds raised. Subtracting the IPO proceeds of S$36mil, total equity is S$63mil (99 minus 36). With a market capitalisation of 177mil, price to book is 2.8. This is reasonably high. PE ratio is 10 (annualised 1Q EPS) which is close to sector norm, leaving investors with possibly better options elsewhere. In a nutshell, I cannot find any obvious strategy that Kim Heng is employing to create growth, other than being a beneficiary within the bright O&G sector - just like her competitors. Its growth strategy utilising IPO proceeds to enhance yard facilities and expand fleet of vessels, and ad-hoc shipbuilding is not attracting me. Personally, I prefer companies that have found niche in these offshore business activities. For instance, vessel owners have core business as vessel chartering, and shipbuilders have core business as shipbuilding etc. Even within these two activities, there are niche of owning/ building specific vessels. Offshore business requires lots of experience and knowledge which I am afraid you cannot do well without years of repetitive experiences to mitigate cost and risk. Covering all areas without "cutting edge" expertise makes it difficult to produce competitive advantages! I am however bullish on the Rig refurbishment and servicing business. The Group also announced strong forward business and had secured commitments with estimated revenue of S$40.0 million (over and above 1Q2014 revenue) as at May 2014 and excluding ad-hoc and other projects that the Group may secure for the rest of 2014”. For now I think Kim Heng may be just another company riding the upward wave of the offshore cycle. Considering the general business model and the substantial losses in 2010, it pays to scour through more offshore companies listed in SGX before making your investment decision. Thanks for your detailed analysis! Yeah this company reminds me of ASL Marine, another family-run offshore marine business.. Indeed ASL and KH has so many similarity. Both are family run and ASL founder Ang Sin Liu still go to the office and his four sons-directors are 2nd gen in the co. KH already consist of 3rd gen. ASL business model is more focus in my own opinion - Shipbuilding, Ship Repair and owning of vessels normally simpler ones. Both has huge overheads from workers and yard facilities, project base non-recurring businesses imply cash flow for both companies is always the biggest challenge!